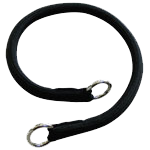 This 1/4 inch nylon slip collar is strong but made of a soft braided nylon. Black only. 16", 18", 20" or 22"